We spent a few days in Prague earlier this month – I was there for work and my wife was tagging along. Never having been to Prague – or anywhere else east of Berlin – I asked around on Twitter, then took the plunge and shelled out for a copy of Max‘s book on the subject. Which, if I’m honest, I found first overwhelming and then frustrating – so many bars were described in glowing terms, and I had so little time! To make matters worse, Max doesn’t rate pubs on standard tourist guidebook criteria, but only on whether they’re nice places to sit and have a pint of something decent and maybe something to eat – and OK, fine, that’s how I rate pubs myself, but how was I ever going to find the Top Five Utterly Unmissable Pubs Of Prague that way? Max doesn’t even go into much detail about the beer – some breweries are better than others, but at the end of the day it’s just this pale lager (světlý ležák), only apparently it’s really satisfying in some way… Baffling. Feeling rather stymied by the whole thing, I set up a Google Map with a semi-arbitrary top 28 pubs (and getting it down to 28 was quite hard enough), and trusted I’d be able to work out an itinerary or two on a quiet evening. Then life intervened; running downstairs to check something on the morning of my departure, I slipped and fell hard on my back. No real damage was done – I can still feel all my toes – but it was not at all comfortable, then or afterwards; two weeks on, it’s subsided to the level of a permanent nagging backache. Adrenalin got me through the journey to Prague; once there, though, anything more than a half-mile walk was rather challenging. My view of Prague was perhaps slightly jaundiced as a result – although when it was good, it was very good. On our first night we ate at a restaurant called Poja, which was quite near our flat in Žižkov and served beer from the Ježek brewery. The brewery’s name means ‘hedgehog’; there’s a picture of a hedgehog on their logo, with a slogan that seems to translate as ‘beer with spines’ (it probably works better in Czech). And it’s true, the beer wasn’t quite as smooth as I was expecting; a distinct aroma-hop spikiness came through, not entirely in a good way. I ordered what was described as a potato pancake (bramborak) stuffed with meat, reasoning that I’d get a crepe made with potato flour or something. I thought it couldn’t possibly be what I understood by a potato pancake – i.e. a Kartoffelpuffer or latke, grated potato bound with egg and fried; I mean, you can’t make one of those big enough to roll up and stuff with meat, can you? It turns out that you can in fact make Kartoffelpüffer the size of a dinner plate – and they do. It was very nice but a bit overwhelming, what with the assorted meat filling and the mound of grated cheese on top; after that meal I don’t think I felt hungry again until we were back in Manchester. That was me and Sádek – and it wasn’t the last beer in Prague to have that effect. As for food, still being half-full from the night before I scoured the menu for something light and came up with “Švejk toast” – toast with egg and bacon. (The waiter was quite disappointed – “Is that all?”) Švejk toast turned out to mean two slices of rye bread, fried till crisp (possibly deep fried), then spread with mustard and topped with two fried eggs and a couple of rashers of bacon (all fried together), which in turn were hidden beneath a pile of chopped tomato, onion and pickled cucumber. Basic, maybe; light, no. We just had a sandwich that evening. That evening we went to another nearby restaurant, U Slovanske Lipy, where I had what would have been my second choice at Poja – roast duck, red cabbage and dumplings. The dumplings were bread-based and not particularly enticing, and the duck was well done going on charred; the meat tasted lovely, though, and it went really well with the red cabbage. But what about the beer? Half a litre of a 12° from Vedova did the now-familiar disappearing act; I remember saying to my wife that it was a bit like drinking water when you were thirsty, only more so. I followed it with a dark beer from Šnajdr, a pleasant light stout which gave me an instant earworm. The architecture is beautiful and historic, but the lack of anything resembling real life, the relentless price-gouging and – most of all – the sheer number of people got to me after a while. The nadir for me was the Charles Bridge, which we crossed in what might as well have been a ten-wide marching column. Once over the river and into Mala Strana, we stopped for a drink at a bar specialising in beers from the Clock brewery; I had the desítka Hektor. Not far beyond that, the pedestrian zone ended and my spirits lifted – not that I’m a fan of cars and trams, particularly, but it was nice to see that the architecture and the history could coexist with ordinary Czechs going about their business. We crossed back over the river by the Legions’ Bridge and had our final Prague meal at a Pilsner Urquell Original Restaurant. Just as I had at U Sadu, we both found ourselves combing the menu for something smaller than a full meal. In what was basically a ‘bar snacks’ section (“Between Beers”) we discovered the makings of an ample, indeed fairly hearty, lunch: pork sausages baked in a tomato and paprika sauce for me, pickled pork sausages (utopenci) for her and a bowl of fries between us. (How do Czechs manage it? Nobody we saw seemed particularly fat.) And the beer? The beer was divine; all the cleanness and uncomplicated drink-me goodness of the best beers I’d had, plus a hit of herbal bitterness in the aftertaste; I’m not saying it was the best beer I had in Prague, but it was certainly in a four-way tie for first. So that was Prague. If I’d been more mobile I might have done more than scratch the surface. Perhaps some time I’ll go back and do it properly, although I’m not sure what I’ll do between beers – the thought of sight-seeing in Prague doesn’t make my heart beat faster, except perhaps with panic. Postscript: a brewery recommended by Max, whose beers I regretted not trying, was Svijany; I regretted it all the more because there was a bar serving them right across the street from our flat, and normally it would have been the easiest thing in the world to wander across for a 13° nightcap. At the airport we were doing the usual thing of using up our coins in the shops, when I spotted some cans with the Svijany logo. I bought one – it was only about 50% more expensive than it would have been in a bar – and brought it home in my hand luggage. A few nights later I opened it. The first impression was both sweet and sharp, but this settled down into something more familiar and clean-tasting; a really nice beer, even out of a can. Max was right: světlý ležák is a plain, simple, straightforward style, so much so that it’s hard to say what’s good about it – but a decent světlý ležák is a really good beer. I was in Brighton for three days last week. My parents lived there for the last twenty-odd years of their lives, so I knew the city quite well for a while, and still know my way around without needing to think about it. Naturally, I planned to spend my free time (a) walking along the seafront (b) walking around town and (c) drinking beer, particularly beer I couldn’t get at home and particularly particularly Harvey’s Sussex Best. 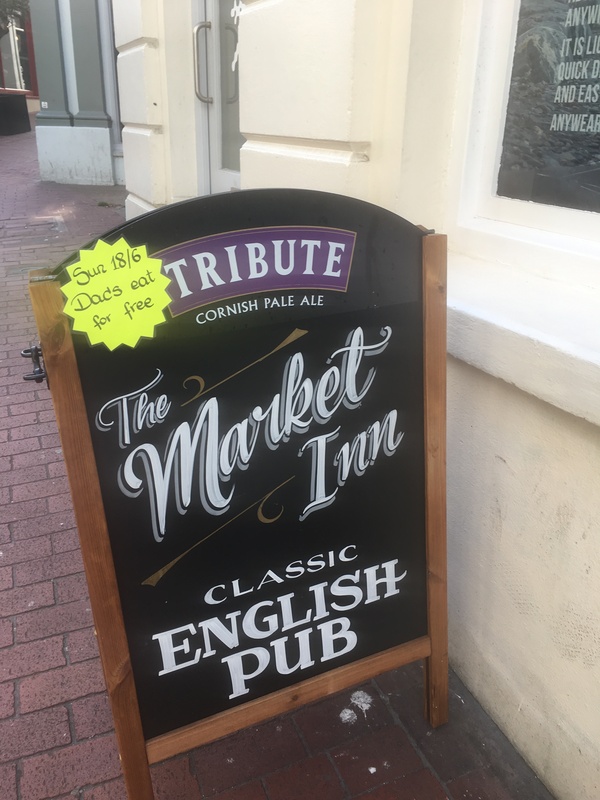 The last time I spent any time in Brighton was before the ‘craft’ thing got started – before this blog got started, come to that – but I had some distinct beer memories. There was the range of interesting stuff they used to have (on draught) at the Quadrant and (in bottle) at an offie further up Queens Road; there were the Dark Star beers up at the Evening Star, near the station. Above all, there was the Harvey’s Sussex Best and all the unassuming little pubs that served it – there seemed to be one round every street corner. Walking, drinking, more walking, more drinking, that was the plan for my leisure hours – and heavy on the Harvey’s Sussex Best. The next day, on a lunchtime trip to the Dorset in the North Laines, I was finally reunited with Harvey’s Sussex Best. If I say that my first impressions were ‘sweet and heavy’, that will probably give you completely the wrong idea. There is a lot of malt there, in the old-school heavy mouth-filling style, but this isn’t a sweet or heavy beer; it’s not hard to drink and it’s certainly not bland. There’s a tannic bitterness running right through it, building to a really clean, refreshing finish – like every good session beer, it’s decidedly moreish. Nice to see you again, HSB. My next beer, though, was another meal accompaniment, and a bit of a bad choice on my part. Manju’s is a rather fine Gujarati vegetarian restaurant, with – unusually – a fairly extensive beer list; I was tempted by the beers from Hepworth’s, a local brewery specialising in gluten-free beers (for what that’s worth). Greed got the better of me, though; I noticed that the standard Indian lagers were priced up at £2.50, and that the table next to mine had a 650 ml bottle of Kingfisher. Bargain, I thought, and duly ordered a bottle of Kingfisher. “Small or large bottle?” asked the waiter; yes, the £2.50 price was for the 330 ml bottle. I was too British to backpedal and order something else, so 650 ml of Kingfisher – which turned out to be £4.50 – it was. Still, the food was excellent. Afterwards I made my way to the nearest Harvey’s pub – the Lord Nelson, a spit from the station and a fair old hike from the seafront (as my ankles reminded me). I had a pint of Sussex Best and one of Harvey’s Armada; not a hop bomb by any means, but a bit lighter and more aromatic than the Sussex Best. Harvey’s brew an extraordinary range of beers, mostly for bottling, and the bar had rows of 275 ml bottles on display (not in the fridge, as far as I could see). I bought a bottle of the Elizabethan Ale; I was initially intending to drink it there, but the place was empty and the landlady clearly wanted to call it a night, so I took it away with me. The next evening I went, again, in search of unassuming, ordinary pubs in the centre. I fetched up in a tarted-up Nicholson’s gastro-pub with bulls-eye glass in the windows; really not quite what I had in mind. (Not the one with the sign pictured here, though – I have got some standards.) Anyway, they had Dark Star Hophead on, and it was very welcome. It was about as different from the Harvey’s beers as it could be – pale yellow, with a loose, soapy head, and hoppy; really very hoppy. Then I headed stationwards again, to check out the Evening Star. Dark Star Six Hop was, frankly, a bit of a disappointment – it’s 6.5% and tastes like it, in the sense that it tastes like they were trying to make Hophead (a) even hoppier and (b) nearly twice as strong. Effortful, really, which is rarely a good look. (What with Hophead, Magic Rock Ringmaster and Marble Pint, I’m starting to think that 3.8% is actually the sweet spot for pale’n’oppy beers.) On keg they had – among much else – Mad Hatter Tzatziki Sour and Lost and Grounded Apophenia. I can report that the Tzatziki Sour actually does taste of cucumber, and that L&G may not be quite there yet on the tripel front, that being what Apophenia is: there was an initial sweet heaviness, that didn’t dissipate but combined with the herbal notes that come in later, to produce a kind of beer equivalent of winter mixture. I had a third, and it took a while to get through. After this slightly disappointing session I looked for something to eat, although – being, on a rough count, four pints down – I was seriously considering having a soft drink with it. Nu Posto, a vaguely crafty pizza place, surprised me with another interesting beer list, including a couple from Hepworth’s. I went for a bottle of their Gold pale ale, which frankly tasted of very little – as golden ales go it was less Summer Lightning, more Rolling Rock – but did have an extraordinary aroma. I’ve never known a beer like it – I put my nose over the bottle and I was getting freshly-baked bread, cut with something sharp and herbal, perhaps sage or thyme. Then I actually tasted it and it was… fine. (And no, it wasn’t the garlic bread I could smell.) Back in my room, it was getting late, I was already pretty drunk and I didn’t really have anything to stay up for, but what can I say, the Harvey’s Elizabethan Ale was calling to me. It’s a big, dark, strong, sweet beer, tasting exactly like I’d expect an old-fashioned beer to taste. Very nice indeed, and easily my beer of the evening. At close of play the next day I was heading home, but before I trudged up the hill to the station – again – I wanted to have at least one drink in a nice, ordinary pub that I remembered from my previous trips to Brighton. Eventually I managed to locate the Lion and Lobster in Hove – probably not a very long-established pub (or not under that name), but old enough for me. And they had… Dark Star Hophead! Harvey’s Sussex Best (with the old ‘barrel’ pump clip)! Dark Star APA! Old Dairy Blue Top! I was very tempted by… well, everything: the first two for obvious reasons, the third because it’s possibly even hoppier than Hophead and the fourth because it comes from Ed‘s old gaff. But I was still feeling a bit worse for wear from the previous day, and wanted to dial the a.b.v. right down, so Hophead it was: pale yellow, loose, soapy head, hoppy as a very hoppy thing. And that – apart from an Oakham Citra IPA from the M&S at the station – was it for Brighton. Overall impressions: Brighton’s changed a surprising amount in ten years. Almost everywhere seemed solidly geared to a specific, high-spending clientele: tourists, stags & hens… hipsters. I’m sorry I didn’t go back to the Craft Beer Co – I think I could have had quite a pleasant session there, even if most of the beers were from that London – but I wouldn’t have felt comfortable spending any time in the Brighton Beer Dispensary; the vibe I picked up wasn’t just hipper-than-thou, it was considerably-more-hip-than-yow. (I may be doing the place a disservice; I was in a foul mood that evening and looking for a very different kind of pub.) Ordinary little pubs round the corner seem to be in very short supply. On the plus side, it’s a lot easier to get decent beer with a meal than it used to be. What’s more, Harvey’s beers are still there if you look, and both HSB and Dark Star Hophead are as good as they ever were. The beer abides. We spent a weekend in Exeter recently. We stayed in a Premier Inn just opposite the main station; handy as far as it goes, although we soon discovered that getting anywhere at all from there (e.g. the city centre or the university) involved climbing a steep hill. Visitors beware! At the top of that hill, though, you’ll find the Imperial, a huge and rather extraordinary Wetherspoons; you can read about the history of the building here. 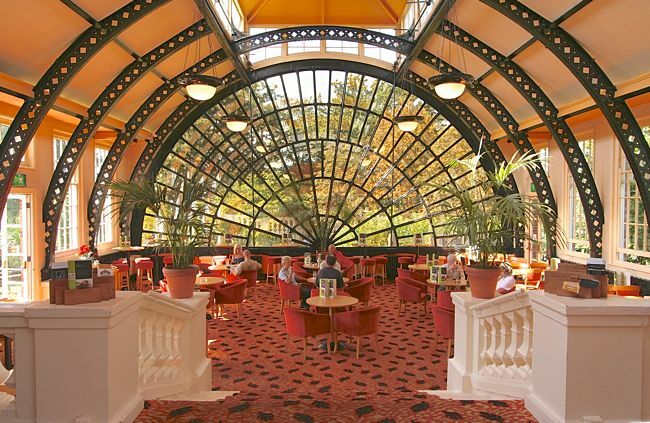 Rather than pay Premier Inn rates, we had our breakfast there; to be more precise, we took our breakfasts in the Orangery. There, indeed, is posh. 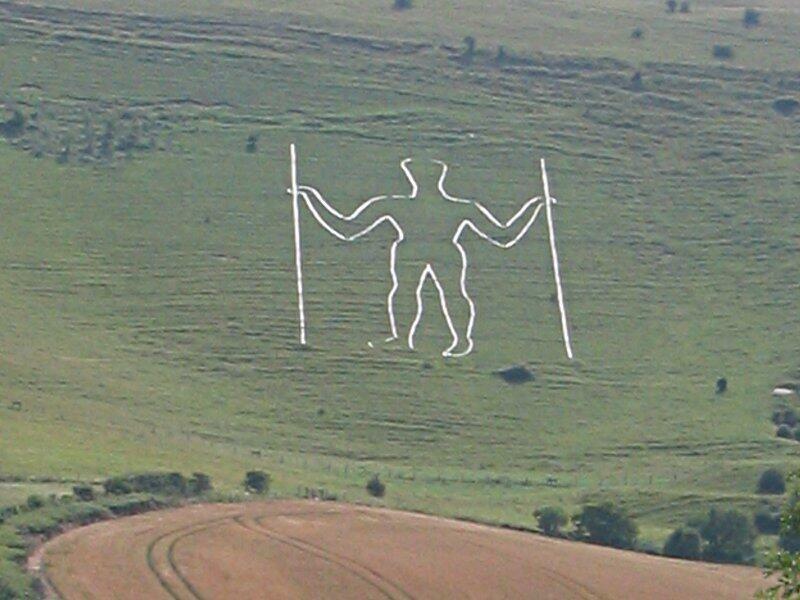 We also went there one evening, and it’s actually the beer I had then that I want to write about: an American Pale Ale from Long Man (a Sussex brewery named after the nearby hill figure). What was interesting about this was both what it was and what it wasn’t. For a start, it wasn’t yellow, or even a pale amber; it may have been a ‘pale ale’ in style terms, but it certainly wasn’t an ale that was pale. 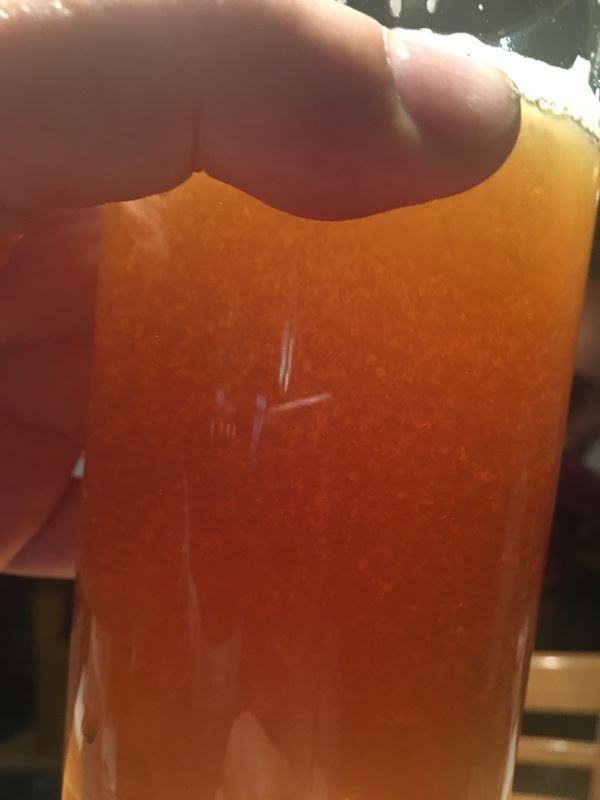 It wasn’t particularly bitter, and it certainly wasn’t a hop-bomb. With a dense, almost chewy body, it was well adrift of Gazza Prescott’s ‘mid-Atlantic‘ style guidelines (“The malt is here to give body, alcohol and a suggestion of flavour and not to balance the hops; if you have balance then there’s something wrong!”). On the other hand, it wasn’t just a brown English bitter with a misleading name: there were (aroma) hops in there, making fruity and herby patterns above the luxuriant ground-level maltiness. I enjoyed it. The following night we were down on the Exeter waterfront – a hip and happening location which, unless I missed something, offers 3 (three) different places to eat and drink. We ate at the Humbledy Ha Hum… a pub of which I remember very little other than that it had a commendably short food menu and advertised itself as part of the Heaviside layer chain. I do remember the beer, though, which was Otter OPA. As the initialism implies, this was another pale ale; it was also amber rather than gold and light rather than bitter, and it also featured aroma hops doing their thing on a malt crashmat. As a footnote to the previous post, here’s something I noticed about the pricing of cask and keg beers in two bars I’ve visited within the last 48 hours. The Library in Durham is a nice, laid-back bar, appealing (as far as I can tell) equally to students and locals. They have two beer blackboards, one labelled ‘cask’ and the other ‘craft’. They’re certainly not pitching to the cognoscenti, but it’s interesting that they think it’s worthwhile to offer a range of keg beers that they can call ‘craft’. The keg beers are fairly wide-ranging – I’ve seen Guinness on a ‘craft’ tap before now – but generally include something from BD (5 am Saint today). They also have a cask offering which is generally just on the interesting side of mainstream – Landlord, Bishop’s Finger and Black Sheep today – plus a cider on handpull. (It was a still cider today (rather a nice one from Cornish Orchards); there was a sign on the bar saying that if anyone wanted a head on their cider they’d be happy to knock one up with the steam arm from the coffee machine. We didn’t take them up on the offer.) The food’s good, incidentally – and served on metal trays, which are at least more practical than boards. The Font in Chorlton – what can I tell you about the Font, other than that we refer to it in our house as TumbleTots? There were, unusually, no families with pre-school children in when I visited last night; I’d say the average age must have been right up in the mid-20s. (Yes, it was a Saturday night, and yes, that was unusual.) Anyway, they have eight cask beers and no fewer than sixteen keg taps; even allowing for a few, mostly rather uninspiring regulars – Flensburger pilsener, a keg cider – that generally makes for an impressive range of ‘craft keg’ options. Plus a 25% CAMRA discount, no less, although obviously this only applies to cask. What struck me in both places was the pricing, which displayed a definite uniformity. A couple of years ago, there was a period when the Font’s keg board routinely listed prices for halves and even thirds, on the basis that (a) the price for a pint would just be too scary (b) you wouldn’t actually want a pint or (c) both. Cask beers were going for £3.20-£3.80 a pint, but a good half of the keg options were up in the £8-9 region; very nice some of them were too, but the disjuncture was a bit glaring. Then there was a period when the two sets of prices seemed to be converging – if the cheapest ‘craft keg’ option was under £5 and the dearest real ale was £4, surely it couldn’t be long before we were looking at one range of prices rather than two. Or so I thought – but then they diverged again. With the exception of Magic Rock Cannonball – a fixture alongside Camden Ink – the really spendy big hitters seem to be a thing of the past: I’m no longer getting my late-night half of something silly from the Font. What’s happened now is that the keg beers (mostly in the 4-6% a.b.v. range, mostly pale) have settled in one price range, and the cask beers (mostly in the 4-6% a.b.v. range, mostly pale) have settled in another. I first took note of this yesterday because the ranges in question are both on the high side: £3.80-£4.90 for cask, £5.60-£7.20 for keg. The point of all this is that, when we talk about beer pricing, we’ve tended to look at it from the point of view of brewers. (For reference, here are the points of view of Cloudwater, HardKnott, Beer Nouveau and Siren.) It’s understandable that we should be sympathetic with brewers’ point of view – by and large, we’d like them to stay in business, after all. But that can easily slip into seeing the world (of beer) in brewer-centric terms, as if the problem of pricing was one that they could solve by gently pushing their trade price up a bit and (in the words of the Siren blog) “educating the market”, building a following of people willing to pay that bit more for beer from Siren (and other comparable breweries). Bars set price ranges, based on the costs they have to cover and what their own particular market will bear; where cask beer is concerned, by and large what they set is a single price range, the price range for ‘cask beer’. Changing that assumption – and turning the cask beer list on a pub’s blackboard into something more like a restaurant wine list – may be even harder than cultivating the perception that the beer from this or that brewery is worth a bit extra. Just got back from a holiday in Germany. It was a two-centre holiday of sorts – we had a week in Wiek, a fairly remote Baltic coast resort, and three days in Berlin. The bottles in the picture above were bought in Wiek, at the local supermarket; one of them cost €1.45, but the remainder were between 88c and €1.15 including bottle deposit. So that’s one of my impressions of Germany: good beer, and local beer – and if you’re lucky good local beer – is readily available in supermarkets & the like. 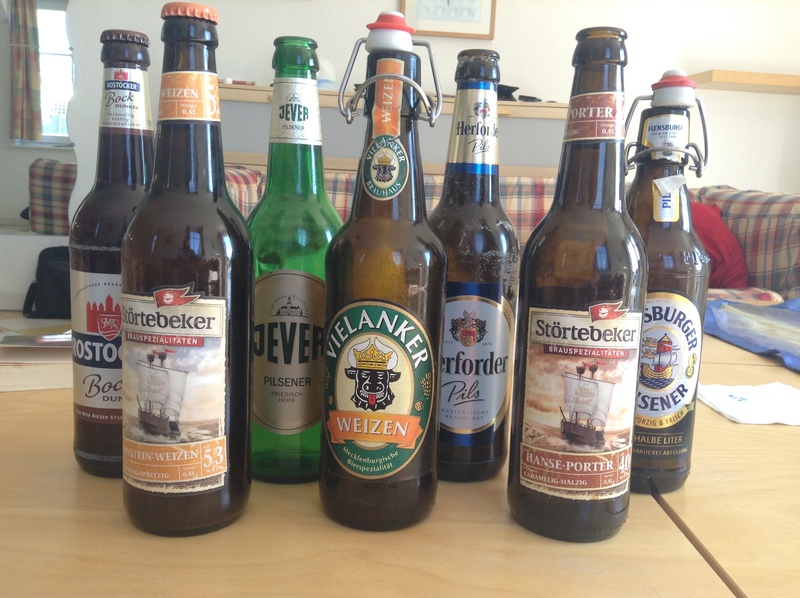 (Above: seven beers from three nationally-distributed breweries and three locals – Rostock, Störtebeker, Vielanker. I could have bought fifteen or twenty different beers at that supermarket, about half of them brewed relatively locally. The rough British equivalent would be a Mace in the depths of Pembrokeshire or Cornwall.) Also, it’s insanely cheap. The strength of the £ helped – we bought our euros at €1.40 – but even at euro/pound parity this stuff would be… well, insanely cheap. Bar and restaurant prices, interestingly enough, were much closer to the British norm – usually €3 or above for half a litre of anything decent. What was it like? Here’s where the good news gets a bit more qualified. With hardly any exceptions – one, to be precise – these beers were fine; clean-tasting, well-balanced, seemed like good examples of their style, etc, etc. The dud was the Störtebeker “Hanse-Porter”: sweet, heavy and strongly reminiscent of Coca-Cola; it got a bit better when I told myself to think of it as a Dunkelweizen rather than a porter, but only a bit. (The same brewery’s (helles) Hefeweizen was… well, fine.) And with only a handful of exceptions, they were no more than fine: 3s or 3.5s on a 5-point scale. The good ones were the Jever (natürlich); the Rostock Bock Dunkel, which (uniquely out of the beers I drank on the trip) was over 6%, and had the big, enveloping quality of a dark old ale; and a Memminger Kellerbier that I had on tap at a restaurant in Berlin. This was a fresh, aromatic, hoppy number that caught my attention straight away; it was the only beer I had in Germany that made me feel I was drinking something interesting. It’s not surprising that I didn’t come across German craft beer – I wasn’t exactly seeking it out. (Family holiday, etc.) What is surprising is quite what a broad range of good, locally-produced beer I did find. My ideal for beer in England – the goal that I think CAMRA should work towards above all others – is a situation where locally-produced beer produced using traditional methods is available in every pub you walk into; whether any of those pubs would be serving beer in a multitude of different styles, or even beer from very far away, is secondary. In Berlin and on the Baltic coast, at least, it looks as if this ideal was realised long ago – if anything, it’s been realised in bars and then rolled out to cafes, petrol stations, roadside sausage vendors etc. And all this without blowing anybody’s tastebuds off or turning bars into multi-coloured beer style swap shops. On the other hand, I really enjoyed that Memminger Kellerbier – and, after ten days of beer that was fine, but rarely any more than fine, I did start to hanker for a hoppy taste-bomb or two. I guess I’m living with the curse of sophistication. In the unlikely event anyone was wondering about it, here’s what I made of those bottles I brought back from Belgium. I was quite keen on Fort Lapin Tripel when I had it on tap; I noted at the time that it had a bit of bitterness to it, unusually for a tripel. I don’t know why there should be a big difference between the keg and the bottle, but a big difference there was. No bitterness at all, and rather a lot of sweetness. It wasn’t sweet enough to get cloying, but it was a lot sweeter than I’d expect a tripel to be; fruity, in fact, and not in a good way. By halfway down I was tiring of it, not least because it had started to remind me vividly of… something else. Something other than beer. As I finished the glass it came back to me: Fort Lapin Tripel, or at least that bottle of it, tasted exactly like perry – and a sweetish perry at that. Disappointing and rather odd. I don’t need to tell you about Westmalle Dubbel. It’s a Trappist dubbel and it’s lovely. Big, dark, malty, but very drinkable. Rochefort 8 is in a similar area. Big and fruity – prune-and-rhubarby, really – but light enough to go down easily. Rochefort 6, for me, worked a lot better than the 8. The 8 tasted a bit like a watered-down version of the 10; although the 6 was lighter in alcohol, I thought it had a more interesting flavour and less thinness on the palate. Slightly less sweet than the 8, and malty more than fruity; a fairly complex taste that developed nicely. Fort Lapin Quadrupel made up for the Tripel and then some. Black, sweet and intense, but without the stewed fruit and cake spice overtones of a lot of Belgians; it reminded me more of an Old Tom or Owd Roger, if you can imagine one of those brewed to 10% a.b.v. Duvel Tripel Hop is being imported, or at least has been imported. Get it if you see it – it’s a bit special. It doesn’t have the distinctive (and deceptive) smoothness of Duvel, but it does have an awful lot of hops. It’s a surprisingly good combination. Rochefort 10 is a world classic and I don’t care who says otherwise. (Probably nobody, but you never know.) It’s 11% a.b.v. and tastes of prunes, which should make for a cherry-brandy-like novelty nightcap; it’s so much better than that, though. It’s as if a crack team of monks had set out to make a distinctively Belgian take on your favourite old ale, but finished early and spent the rest of the day making it twice as good as that. Then come back the next day, doubled its strength (possibly through the power of prayer), and then stayed late to make it twice as good again. It’s a very, very lovely beer, I bought it in a supermarket where it cost me the euro equivalent of £2 exactly (including bottle deposit), and I want another one right now. Saving the rarest (and biggest) till last: Mont Des Cats produces one beer, which I spotted in ‘t Bierpaleis in a 75 cl bottle, going for €7.50 (about £6.40). (I don’t know if they bottle it in any more user-friendly sizes; that was the only bottle I saw.) I bought it, I took it home and – some time later when I had a free afternoon – I drank it. It’s a darkish, coppery tripel: full-bodied, herby, not too sweet, and all in all not a million miles from Orval. Very nice indeed, although I’d recommend whacking straight through the whole bottle if you do get a big one – I left mine standing half-full for a couple of hours, and the condition suffered quite badly (should have put a teaspoon in the bottle). Mmm, Belgian beer. Very lovely and all gone. Actually not quite all – I’ve still got one bottle left: an Orval, which (having had it ‘young’ in Bruges) I’m leaving to age in the bottle for six months. Roll on February! We had a long weekend in Bruges a bit back. Bruges is as beautiful as you’ve heard it is, and very nearly as beautiful as it looks in the film (and if you haven’t seen the film, do yourself a favour and seek it out pronto). The beer was pretty good, too. Here are the tasting notes I jotted down on my iPod, with added commentary. This was at a bar called De Gilde in Oude Burg, a street which seemed to be on the way to (or back from) most places we went – we walked down it about three times every day. I ordered it under the impression it was a local beer (what with the name) & was disappointed to find it was one of Palm’s. It was fine, though. There were a few Leffes we don’t get over here. Radieuse is marketed as “Leffe goes hoppy”, and it was, a bit. I had this with dinner the first night. Mmm, Flemish beef stew. The next few are from what’s probably my favourite bar of the trip, ‘t Brugs Bieratelier. (Thanks to Chris M for tipping me off to this – although, as it was two doors down from our hotel, I probably would have found my way there eventually.) The Bieratelier specialises in draught – which is to say, keg – as distinct from the massive bottle menus offered by most places. I had two lots of three small beers – 100 ml? 200? I’ve no idea how much I was actually getting, which is a disadvantage of beer from the tap – at least, it is in a country which hasn’t gone through the kind of standardisation we take for granted in the UK. Anyway, you got three beers for €8 (plus complementary peanuts) which was basically fine by me. It was a quiet, laid-back weekday late night, which meant there were only a handful of English people ordering pints of lager (in English) and only one stag party (from Holland). But, in all seriousness, it was a quiet, laid-back place – the atmosphere was so relaxed that it seemed to soak up the rowdier elements without being affected by them. The quiet soundtrack of Dylan album tracks may have helped. Fort Lapin (“strong rabbit”?) was a new name to me; their tripel was rather nice & a few steps away from the usual “pale, strong, a bit fruity, a bit herby” template. There were hops there, I’ll be bound. I’ve been slightly sniffy about St Bernardus before, what with them not being Trappists, but the dubbel was extraordinary (it knocked the Gouden Carolus into a cocked hat). Not as extraordinary as Landtsheer Novice “black tripel”, though. It was basically what you’d get if you spliced the genetic material of a tripel with a black IPA. Very hoppy, very roasty, very Belgian – quite unusual! As for the lambic, I have drunk it before – some years ago, when the relative strength of the pound made Belgian imports a regular buy – but it was a bit of a shock to the system coming in among those dubbels and tripels. I think getting properly into lambic would take an evening of its own, or possibly a trip of its own. The barman saw the face I made after my first swallow and apologised – “It’s not very sour, is it? That’s the only lambic we can get in a keg – the good ones are only available in bottle.” Let’s just say that the problem I’d had with it wasn’t a lack of sourness. for about 50p. (The Belgians never got the memo about minimum pricing.) Having noticed a distinct groundswell of English people ordering in English, I was determined to use what little Flemish I had. (Belgium is bilingual, but Bruges – which we should call Brugge really – is deep in Flanders; French is about as useful there as Spanish.) “Drie groote frites, alstublieft”, I said to the guy behind the counter. “Three large chips – what would you like on those?” he replied, not missing a beat. for what that’s worth. That night we had an Italian meal at a rather fine restaurant called La Riva del Sole (very nice zabaglione); I know I had something with it, but what it was, my iPod and I cannot tell you. Dating back to the 1700′s, De Garre is one of those places where the gentle atmosphere and ambience has your mind wondering how many people have sat here before you. What joys, tragedies, laughter, crimes or drunken buffoonery have these four walls witnessed in their lifetime? The Tripel arrived in two large goldfish bowl like glasses, with the thick white creamy head massively outweighing the liquid content by about three parts to one, there being only approximately three quarters of an inch of beer sitting at the base. Either by sensing our unconscious looks of disappointment or by the daily experiences of newcomers to his bar, the barman softly whispered “wait, it will come”. Each tray of beer is served with a small portion of chopped cheese, which I’m led to believe is a compatible match for most Belgian beer, it was soft, creamy and when finally, patience rewarded we got to taste the Garre Tripel went perfectly with the beer. I arrived to find a tiny and brightly-lit bar with every table taken. (No standing at the bar in Belgian bars.) The barman caught my eye, held up one finger and pointed upstairs, then shouted something indistinct which I (correctly) interpreted as “you want the Tripel?” Upstairs was a slightly larger but even more brightly-lit bar with every table taken but one, right in the far corner, directly under a couple of halogen lamps. I manoeuvred the furniture around until I could get behind the table. The barman brought my drink. (It came with peanuts, and soft whispering was not involved.) I tried to concentrate on (a) my beer and (b) my paper but found I was fighting a losing battle with (c) the glare and (d) the noise of what appeared to be 300 English and American beer geeks having animated conversations all around me (“as for what I’m thinking, nobody has the RIGHT to censor what’s in my MIND…“.) I got to the bottom of the glass sooner than I expected and looked up to see the barman standing over me. “ANOTHER!” he enquired. I shook my head and got my purse out. And that was about it for De Garre. As for the beer, it was a very heavy tripel; it would have been pretty nice but for an unpleasantly strong flavour of alcohol. Basically it tasted like a tripel which had had a tequila dropped in it. I was seriously considering going into the Bier Bistro on Oude Burg on the way home for something more palatable in a more relaxed atmosphere, but the atmosphere that night was a bit too relaxed – by the time I passed it was shut. There wasn’t any daytime drinking the next day. In the evening I had the bright idea of going out before dinner instead of last thing at night, and found my way to bar #2 on my hitlist: ‘t Brugs Beertje. It was rammed – so much so that I had to share a table – and absolutely everyone was speaking English, but somehow the atmosphere was much more laid-back than it had been in De Garre. And the beer was great. That’s De Struise Pannepot, De Struise being a newish local brewer (est’d 2001). I’m not sure how you’d classify Pannepot: it’s very dark, very strong and made with spices. Possibly a Quadrupel? It was very nice indeed, whatever it was. Very malty, as my tasting notes suggest (Virol was a ‘malt extract’ given to babies; I was once found, aged two or three, eating it out of the jar). As for the Orval, the Beertje will serve you a young Orval for €2 or one that’s been aged in the bottle for six months for €2.50. I guessed, rightly as it turned out, that the ‘aged’ variety would be what I’d had before, and ordered the ‘young’. It was… interesting. Much lighter than the Orval we know and love (although presumably it’s just as strong); I was reminded of ginger beer. I wish I could have followed it with an ‘aged’ bottle, to compare and contrast, but I had to get back to base camp. Can’t improve on that, except to say that drinking a Westmalle tripel out of a Westmalle glass really does feel special. Regrets, I’ve got a few. I didn’t get around to the Halve Maan brewery tour, which famously concludes with a freebie Zot; I didn’t get to the Bier Bistro, Cambrinus, the Café Rose Red or the Trappiste; and, of course, I barely scratched the surface at ‘t Brugs Beertje. My son, who recently turned 18, was less enthusiastic about the drinking than I’d hoped; he’s decided he’s into cider, which wasn’t a big feature of the local bars. Another time. Also, beers – I’ve got a few of them, too. There are tourist-oriented bottle shops all over Bruges; in one of them I saw, and declined to buy, all three of the Westvleteren beers (semi-illegal and at ridiculous markups). But really there are only three places to buy beer, and two of them are supermarkets. Here’s my till receipt from the Carrefour near our hotel. “Leeggoed” = bottle deposit; in effect everything came out 10c dearer than it looked (or 50c in a few cases, such as Delirium Tremens). But the selection was frankly extraordinary, and the prices were mind-boggling. 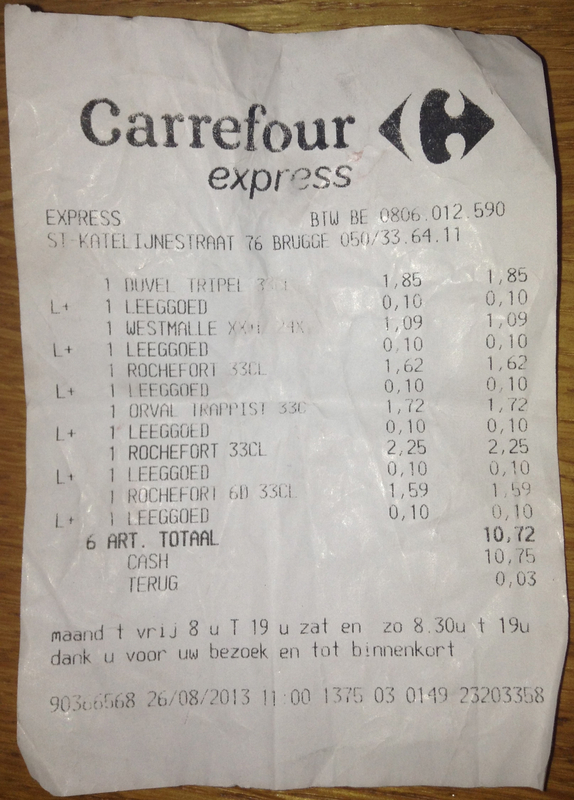 That €1.09 for Westmalle Dubbel isn’t unusual; the Rocheforts and the Duvel (Tripel Hop) were the pricey ones. (And the prices went down if you bought a six-pack. Six-packs of Trappist beers in the equivalent of Tesco Express – what a country!) The bottle shops were all selling these same beers for €2.50 and €3.50; they could actually stock up in Carrefour and still make a profit. Except for the inevitable question: where’s good in Bruges (Brugge if you prefer)? No, I mean, where’s really good? And – just as importantly – where’s actually not that good? I shall be travelling with two non-enthusiasts and one non-drinker, so being non-beer-fanatic-friendly (and e.g. serving food) will be a definite plus. So, who’s been to Bruges, and where would they like to be back right now? I know, Martyn‘s done this one already, and it’s not hard to find bar reviews online. But I thought I’d ask anyway.